Krøger A/S, the manufacturer of the MK caulking guns, was founded in 1922 in Denmark. The MK product range includes manual and pneumatic caulking for any application (cartridges, sachets or bulk pack). Today, all products are still produced at the MK factory in Denmark. 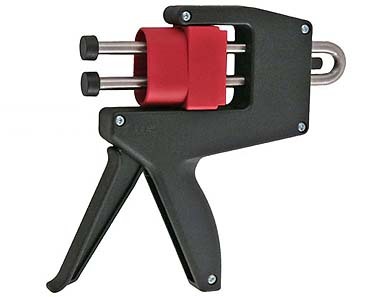 "The World’s Strongest Caulking Gun"
Manual and Pneumatic Guns are available for the following cartridge sizes: 80 ml, 310 ml, 400 ml, 500 ml, 600 ml, 750 ml, 1,000 ml. 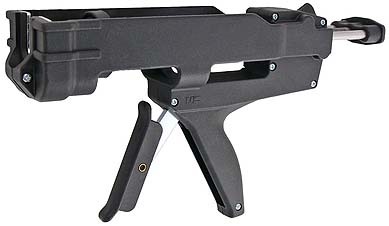 Manual and Pneumatic Guns are available for the following sachet sizes: 400 ml, 600 ml, 1,000 ml, 1,500 ml. The above pictures are only a few examples of an extensive selection for various packaging forms, sizes and viscosities. The link to the complete selection of all caulking gun models and variations is available from the Downloads & Links page. There are over 30 different sizes and mixing ratios of dual and coaxial cartridges for which manual and pneumatic guns are available. 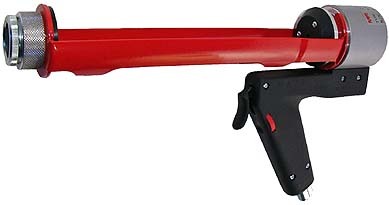 The link to the complete selection of all caulking gun models and variations is available from the Downloads & Links page. © 2005 Southeast Asia Link Co., Ltd.